Kathleen Spicer found an American Snout in Advocate, NS, on Canada Day. This vagrant species has only been recorded once previously in Nova Scotia – Jeff Ogden and Katherine Goodwin collected a specimen in Brier Island in 2004. The other two Maritimes records for the species, both from NB, are from 2010. American Snout found by Kathleen Spicer near Advocate, NS, on July 1, 2012. Photograph by Kathleen Spicer. Kathleen’s record, along with the Common Buckeye found in Saint John in June, are indicative of a very good year for migratory vagrants. Keep your eyes peeled for any unfamiliar butterflies, vagrants can show up just about anywhere! These vagrants are part of the huge wave of migrants that continues to arrive in the Maritimes. Migrants that are abundant this year are Question Mark, Red Admiral, and American Lady. Monarchs have also arrived in large numbers over the past week or so; keep your eyes out for eggs and caterpillars on milkweed! 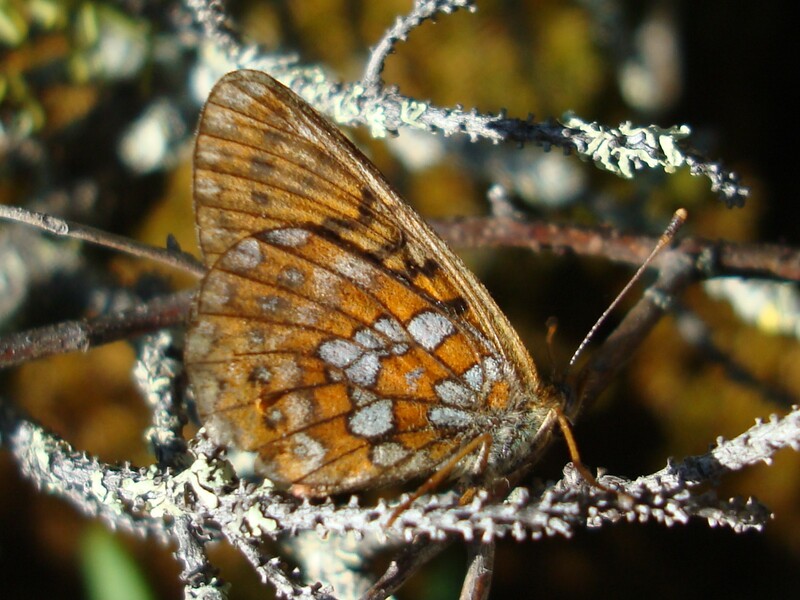 Roy Lapointe found two new populations of Bog Fritillary during the past two weeks. This bog dwelling species was previously known from only five sites in the Maritimes, so Roy’s findings are quite significant. A very worn Bog Fritillary found Roy Lapointe 12 km northeast of St. Leonard, NB. Photograph by Roy Lapointe. 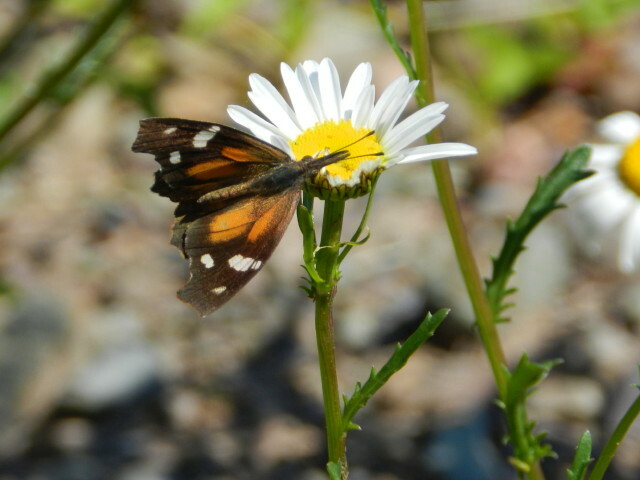 Other significant sightings from the past couple weeks include: a Pepper and Salt Skipper found by Ken McKenna near Lower Caledonia, NS, another Pepper and Salt Skipper found by Richard Mash near Moshers Lake, NS,Bronze Copper found by Gilles and Norman Belliveau at Cap-Pelé, NB, Indian Skipper found by Ken MacIntosh at Dan Brook, NB, and Baltimore Checkerspot found by Rosemary Curley at several new PEI locations. Several fairly common but frequently overlooked species are now on the wing. These include Bog Copper, which is widespread in bogs and other habitats with cranberry, Northern Blue, a species common in coastal barrens and coastal bogs with an abundance of crowberry, and Least Skipper, a species of wet grassy habitats.